With clean cut minimal styling combined with retro influences echoing back several decades, Natuzzi C013 Icaro is the Herald of a brand new design ethos. With power up headrests that actually lower to become the upper part of a high back sofa, that can be tilted also to find the users optimum comfort, combined with of the floor styling sat on futuristically metal legs. 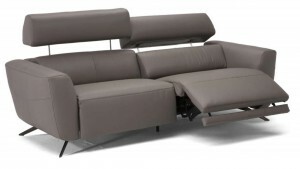 The arms are similar to the Square style ones but angle upwards giving the sofa very futuristic look. This design also lent itself to maximum comfort that one usually only gets from the more traditional hi back models. In addition to being available in three seater, two seater, armchair the Natuzzi C013 Icaro is also available as a stunning corner group with arm to arm configurations. When looking at this fabulous design one can’t help but think that this will be the future of sofa design for the next few years, as well as being this season’s latest design and collection. The contrasts in the retro and futuristic design of this contemporary designer sofa can also be further enhanced by selecting from a world of leather for example putting natural rustic leather for a more urban industrial or country living setting that contrast beautifully with metal legs and the futuristic styling, or selecting a protected leather and a solid colour to suit your individual living space. The first Natuzzi C013 Icaro to arrive in the UK will be at Furnimax Accrington Lancashire which is England’s largest Natuzzi Editions Gallery and outlet store showcasing over 50 different sofa groups from the brand. Customers browse and receive a full understanding of all the leather available with visual displays and comprehensive swatch trolley in addition to being able to see the letters showcased on many different sofas. Visit our Huge Factory Outlet - Open 7 days a week! Natuzzi Editions accessible designer sofas.